Today’s post has been indefinitely delayed because I found this in my house this morning! That’s a 10in diameter glass bowl btw. I must make sure this isn’t a sign of the impending apocalypse and is just a hazard of living where I do. Needless to say this has derailed my plans for the day. Gagh!! Not what you want to find in the morning! What is it?? Actually, given that it's almost Passover – my immediate thought was not the Apocalypse, but rather that the 10 plagues have begun! Blech! Is that a scorpion? 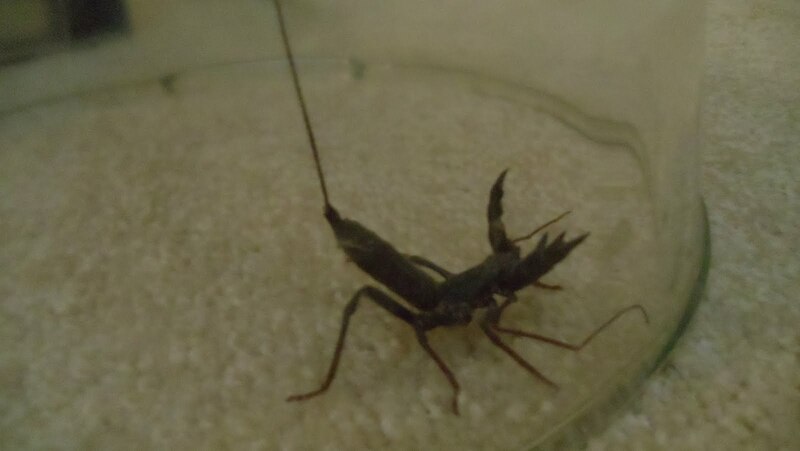 It's something called a “whip scorpion” because the tail isn't a true scorpion's tail with a sticker. Not poisonous, thank god, but still…in my house! Wow. I was going to say scorpion because of the massive pincers. That, or tiny land lobster. Eeeek! It likes like something from a Star Trek episode I once saw only slightly smaller, LoL. I don't mind bugs if they're outside because that's where they're supposed to be. But bugs freak me out in the house! I don't know what I'd do if I saw that thing in my house. The worst thing I deal with is house centipedes but that's nothing compared to that thing. Yeesh! Besides knowing that it's a scorpion and a harbinger of death, I have no idea. I hope you start tucking your pants into your socks. Just in case. Oh my gosh, I think I'd flip a switch if I saw that in my house. What did you end up doing with it? Woweee, that is one scary looking bug.